This shrimp cocktail? It renders me speechless. I have never, ever in my life had such delicious, succulent shrimp. Ever. In fact, I am laughing that I actually went ahead and put that this recipe serves 6 to 8 because honestly, I will not admit to you that I ate all but 7 shrimp before my husband got home from work. Ok, so I just admitted it. But in my defense, the inhale occurred over several hours and in addition, shrimp is lowfat and healthy-ish, right? Either way, I feel no guilt because I want to weep with joy at how delicious this shrimp cocktail is. And that’s just the shrimp! The cocktail sauce? Drinkable. And so easy, you’ll wonder why you would need to buy it ever again. To be fair, shrimp cocktail has not been on my bucket list of things to make. We hardly ever buy it from the store (probably because it’s pretty nasty – limp, mushy shrimp and mysterious cocktail sauce). But when I spied this in Cook’s Country, it looked so appealing (and so fabulously simple) that I made it that same day. Really…if you are even thinking about serving shrimp cocktail in the remainder of your lifetime, do me a favor and make this instead of buying something questionable at the store. You’ll be so amazed by the deliciousness, you’ll probably want to call and offer me your firstborn child or millions of dollars, but please, refrain. I already have plenty of my own children and I can’t ethically take your money because the recipe isn’t my own creation. All you need to do is simply email and say you had a hard time not eating every last shrimp, also, and I will feel justified and happy. This lovely shrimp cocktail is headed to the Best Recipe section immediately. Combine the shrimp, 4 cups cold water, salt, thyme, peppercorns, bay leaves and celery seeds in a large pot. Cook the mixture over medium-high heat, stirring every so often, until the water registers 170 degrees and the shrimp are just beginning to turn pink, 5 to 7 minutes. Remove the pot from the heat and add the lemon peels, juice and lemon halves that have already been juiced. Cover the pot and let the mixture sit until the shrimp are completely pink and firm, 5 to 7 minutes. Stir the ice into the pot and let the shrimp cool completely, about 5 minutes. Drain the water and peel the shrimp, leaving the tails intact. Refrigerate the shrimp up to 24 hours until ready to serve. For the cocktail sauce, whisk all the ingredients together until combined. Store in the refrigerator until ready to serve with the shrimp. The shrimp and sauce may be made up to 24 hours in advance and refrigerate. If you can't find shrimp that are deveined, simply cut through the top of the shell along the vein line (leaving the shell on the shrimp), and remove and discard the vein. Happy Valentines Day Mel, I went to your web-site for a shrimp recipe, because like you I and in the Mid-West. 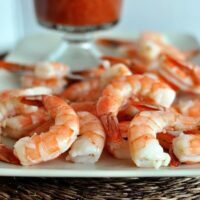 Have shrimp in the freezer and want to make it for my husband tonight as a suprise. I never cook seafood. Bought mine from a seafood vendor that frequents the area. Frozen, shelled and devined. Should I thaw first or I saw the brine someone did. Any suggestions would help, feeling intimidated. Yes, if you can – thaw the shrimp first! That should work great. This knocked everyone’s socks off. It’s a keeper. I won’t ever do anything else for shrimp. What would we do without you, Mel? Amazing taste!! What a wonderful way to spruce up a regular shrimp cocktail! Silly question on this… I buy my Shrimp at Costco and it only comes peeled. You recommend shell-on but do you think it would make much of a difference if its already off? I am cheap and don’t want to waste 2 lbs. of shrimp finding out the hard way! 😉 Thanks!! Hey Pam – that’s a good question. You sound a lot like me which means I say go for it and use the Costco kind. I would keep a close eye on the shrimp as they cook – my guess is the time may need to be cut down since the shell is off. I’d never actually made my own cocktail shrimp before — who knows why not — but these were great! I will not buy shrimp cocktail again. We made this yesterday and it was a huge hit! Thank you for this recipe! We will be making this again! Can’t wait to try this. I found a slightly different version online and made it last Christmas: bottle of beer, 1 T each peppercorns and red pepper flakes, 2 bay leaves. Bring to a boil. Simmer shrimp for 5 min. Drain. I think the lemon flavor will add a punch to the shrimp. And thanks for the cocktail sauce recipe. It sounds easy and is made with ingredients that I already have in the kitchen. This is going on the Thanksgiving menu. This is the best shrimp cocktail I have ever tasted! I have made it twice already. I will be posting the recipe tomorrow and linking back to you. Thanks again for an awesome recipe! Can we eat them as soon as they are chilled or do we have to wait a full 24 hours. I may have understood that wrong. I had planned to make this for a New Year’s Eve get-together at a friend’s house last night, but then we stayed home with a sick kid. So I had $14 of shrimp in my fridge and decided to go ahead and make it anyway today. I’m not much of a seafood connoisseur, but I will say that it was definitely tasty, if a bit salty. (Maybe that had something to do with my shrimp?) I was about a tablespoon short on my horseradish, but the kind I had was “extra hot” so my sauce came out nice and spicy. I’d still use less next time. Mel, you are my go to girl for all meals. I have loved absolutely everything that I have gotten from your blog. With that said, I’m looking for a go to shrimp and grits recipes. Any ideas? Oh.My.God! This is freakin’ outstandingly delicious!! I just made it for hubby. He loves cocktail sauce and he is raving about this. The shrimp–to-die-for tasty! Soooooooo glad you shared this. I love the way the shrimp came out. First I cleaned and peeled shrimp but left the tail on. Then I brined the shrimp for 1/2 hour in equal parts of kosher salt and sugar and 4 cups water. Then drained and followed above recipe! Awesome. Makes even farm raised shrimp taste good! Maybe it’s because I’m from New Orleans that I find it funny that you would even purchase Shrimp Cocktail already made in the grocery store. (I refuse to purchase canned crab meat, but I do have the access to fresh crab meat.) It’s just way to easy to make. 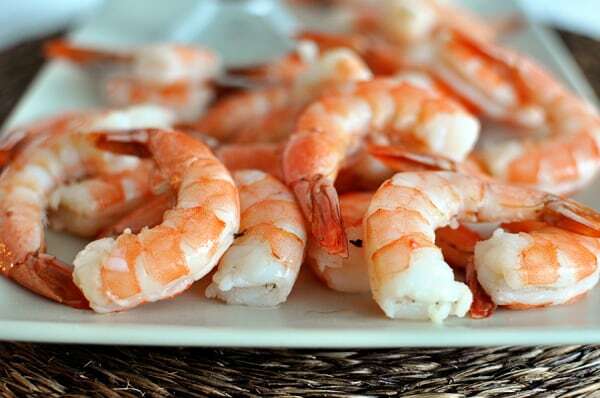 It is much easier to peel the shrimp raw than cooked – you can still leave the tails on with one section of the shell. Leaving the shell on while boiling them doesn’t add to the flavor. There are times when the Cocktail also includes shredded Iceberg lettuce. I’ll have to try it with the Old Bay, all the other ingredients are normal to the sauce. Shrimp Remoulade is another fantastic appetizers/salad. There are times I make it for a meal. The Remoulade is not made with Thousand Island dressing as another said that’s all they get where she lives. If you are interested I can share a normal Remoulade recipe and/or a Blanc Remoulade sauce recipe with you if you would like to try them. I also do not like the China shrimp or crawfish — Louisiana Gulf shrimp are really the very best shrimp in the world. Also, Mel if you are interested in some authentic south Louisiana recipes let me know – my mother was Cajun. Where did you get your shrimp? Festival, Sams? This looks delish! Wish I could make it, but can’t since my hubby is allergic to shellfish. 🙁 Bummer. I have to get my fix when I go out to eat occasionally. I’m not a big fan of boiled shrimp, so I think I’m going to try to bake the shrimp on a sheet pan instead. I like how they get the little bits of brown on the edges which in turn just means more flavor! And I’ll combine the other ingredients for the shrimp along with a bit of oil as a marinade for the shrimp prior to baking. Do you think this would be just as good? Sarah – honestly, I think boiling the shrimp in the herbs and other flavors is what makes it so delicious. So I don’t think I’d like baking it quite as much, but then again, I like boiled shrimp. I’m sure if you prefer shrimp baked that way, it will still be great. 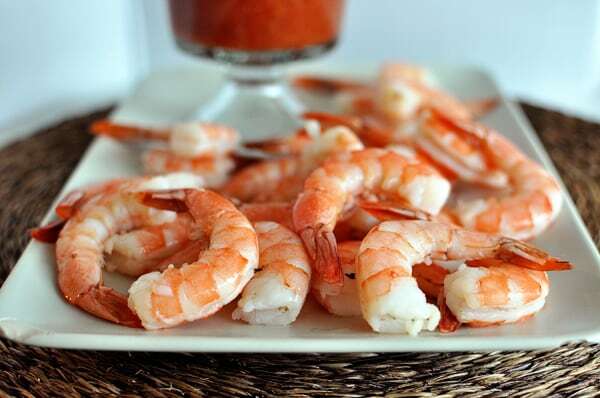 My husband doesn’t eat shrimp so I will be able to eat them all – totally guilt free. Seriously, this post couldn’t be more timely since I’m sure many of us will be wanting to serve shrimp at some point this holiday season. Thanks! To substitute for Old Bay (which I don’t buy because this is cheaper and just as good), mix together 1 part garlic salt, 1 part onion powder, one part ground celery seeds (not salted), 1/2 part cayenne pepper (or to taste), and 1 part sweet paprika. Save any leftover in a tightly closed jar in the fridge for ever. Esther – I actually use the black peppercorns. I think Catherine’s idea of making your own Old Bay seasoning would probably work out best since I don’t know any great substitutions. The reason I was searching for an alternative is because I am very sensitive to MSG (monosodium glutamate) and, although MSG is not listed on Old Bay’s ingredients, I am suspicious of any seasoning mix that is “THAT” good. Since there are other additives that give the same effect as MSG, but aren’t called MSG, food manufacturers can put it in their product without actually listing it transparently. I don’t want to take any chances, so if I make this shrimp cocktail, I will try it with the homemade version of Old Bay. Hope that helps somebody. We even love the limp shrimp cocktail, so I can hardly wait to try this. It looks perfect for a New Year’s Eve treat! Hi Mel, this sounds really good! I love shrimp cocktail, but all we get here is just shrimp with thousand island sauce.. So ya, blah. Just need to clarify two things – by peppercorn, you mean the white ones yes? And we dont have old bay seasoning here, wht would be a good alternative? Thanks! I love shrimp cocktail..Im always hovering around it! I can’t wait to try this one! I made this last month and it was fabulous. Best shrimp cocktail ever! And I’m not a huge fan of shrimp cocktail, primarily because, as you said, it’s pretty blah when you buy it at the store. I completely understand why you nearly ate the whole batch. I couldn’t find shrimp with the shell on around where we live, so I just used shrimp with tail on/deveined/no shell and it was fine. This looks delicious, Melanie! I love the addition of the Old Bay in the cocktail sauce! Oh, this is the same recipe we use and I can agree…. best shrimp cocktail EVER.